Embellish a Canvas Backpack With Embroidery! Take a basic canvas backpack from bland to buzzworthy with a little bit of embroidered embellishment! You or your child will always be able to recognize your bag with its one-of-a-kind design. Most simple patterns will work on a backpack, including floral motifs or mini patterns used for patches. The hexagon design used in this tutorial can be easily customized to fit on any style of bag. Whether you want your backpack to stand out as you go back to school, or you simply want to transform an everyday rucksack into something special, this is one DIY that you'll be proud to show off! You can use just about any basic embroidery pattern for this project, but if you want to add a hexagon design to your backpack, download and print out the hexagon pattern page. The hexagons are a larger grid of the shape so you can map out a design that works on the backpack you're embroidering. Make a mark in each shape that you want to include. Place the tracing paper over the pattern. If you have a light-colored bag, trace the pattern with a fine-tip iron-transfer pen. Remember that this design will be reversed, so plan accordingly. If you are working on darker fabric where the pen won't show, use the tracing paper method for marking the pattern. Trace the design with a regular pencil. If you are using an iron-transfer pen, pre-heat your iron, then iron the fabric to warm it up. Place the traced pattern ink side down on the backpack and carefully press the tracing paper. Take care that you don't move the iron around as you do this, or it may result in a double image. Also, the longer and harder you press, the darker the image will be and it's easier to cover a lighter image. If you are using the tracing paper method, pin or baste the paper to the backpack. Canvas can be hard on embroidery threads, so it's a good idea to coat the floss with thread conditioner before you start stitching. Thread your needle with as many strands as you wish. The example is worked with six strands of Aurifil embroidery floss, which is a bit finer than DMC floss. Start your embroidery as you would any other project. Then, work the design with a basic stitch, such as back stitch. If your backpack has a lining, you may need to work your stitching using the sewing method, as you won't have access to the back of the fabric. Along with the outlining on your backpack, it's nice to have some fill stitching. The hexagons in the example use a modified version of satin stitch. Instead of always coming up on one side of the area and going back down on the other, the stitches are worked back and forth, and side to side. Remember not to make your satin stitches too long. A bag like this is likely to get a lot of wear, and you don't want those stitches to snag. If you are struggling to pull the needle through the fabric, try changing to a larger needle size or using fewer strands of embroidery thread. Canvas usually has enough stability that you won't need to use a hoop, and in many cases, there wouldn't be room to hoop the area you're stitching. However, holding the fabric as you work can be hard on your hands. Take breaks as needed. Create a cluster of hexagons that fits an area of your backpack or scatter a bunch of single hexagons around the entire bag! Personalize your embroidery by adding initials inside some of the open hexagons. The flap on this rucksack-style bag was a perfect spot for some stitching. 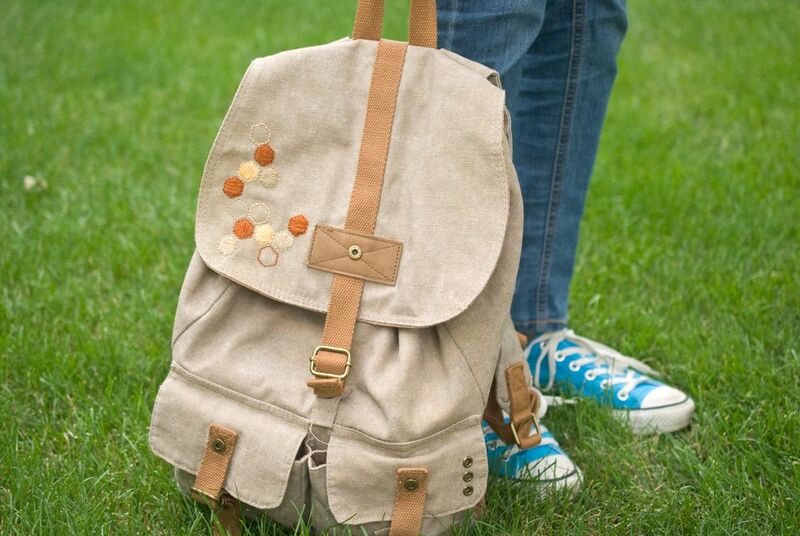 The body of a backpack, the pockets or even the straps are also good areas for embellishment. Use these same principles to embroider denim jackets or canvas tote bags!